Life, the Universe and Everything… | Life in the Cloud, the Java Universe and Everything else. I’m now coming back from a trip to Salvador, a beautiful city in the Northeast of Brazil where I went to speak at the LinguÁgil event. LinguÁgil, as the name implies, is a clever mixture of “Language” and “Agile”. The event joins together many communities that are traditionally not engaged, and mixes many language communities — Java, Ruby, Python, C# and others — all under the common theme of Agility and software development best practices. The event is run by several User Groups, and the Java community is represented by JavaBahia. This collaboration between groups is the strength of the event, that not only shows that working together is possible, but also makes the event more relevant, more interesting for attending developers and also more rewarding for potential sponsors. With all the difficulties associated with the making of an event, Java User Groups should consider the benefits of teaming up with other local groups — both Java and also from other technologies — to create something that is larger, more meaningful, and as such, able to attract better speakers. LinguÁgil is a fine example of success doing just that! 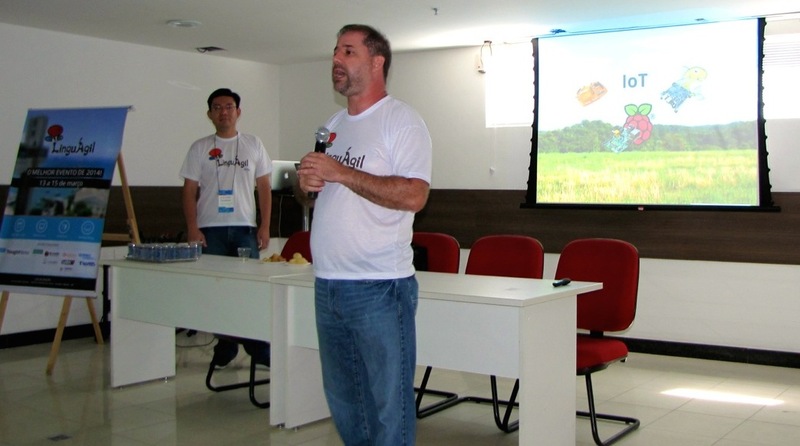 Other events in the near future here in Brazil that have achieved success by the joint efforts from multiple communities include The Developer’s Conference (TDC), that brings together many developer-focused communities, and the Fórum Internacional Software Livre (FISL), that attracts many Free and Open Source communities from all over the world. Pre-event activities: time with friends! 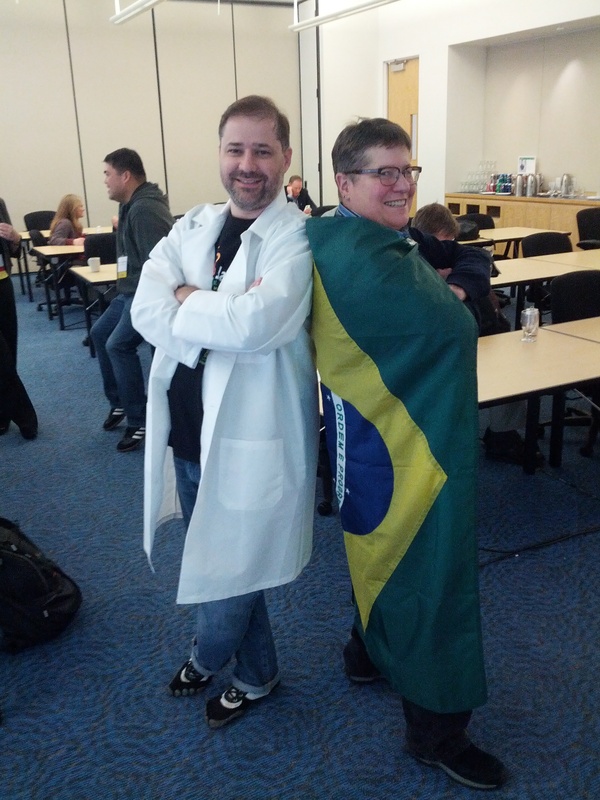 Before the event started, I got to spend quite some time with Serge Rehem, a friend since the time I joined the Brazilian Income Tax Application Java team. With his untiring energy, Serge used to be the instigator behind many activities around Java in Salvador, and was one of the original wranglers that lassoed the diverse communities into working together to make LinguÁgil. Serge also worked on many other initiatives that helped improve the state’s position in the Brazilian development scene. A mixture of developer, entrepreneur, manager, marketeer, Serge has interest and experiences all over the spectrum! It was an amazing time discussing with him marketing ideas for startups and his ideas on how to grow my own startup, ToolsCloud. Serge is the mastermind behind my recent series of videos around open source development tools (pt-br), and we spent time discussing other cool ideas. Be it swimming in the beach in Guarajuba or eating an amazing “Shrimp Bobó” (Bahia definitely has the best sea food dishes I ever had!) we discussed so many things! From new ideas of software products, to parenting and what we can do to help our kids learn about computers and programming, to new business and even religion. I have to thank Serge’s family — specially his wife Larissa — for putting up with our endless conversations! LinguÁgil starts with 2 full days of tutorials. Spread over many parallel tracks, speakers have a chance to present 4 and 8 hours tutorials, diving into a specific topic. My talk was a tutorial on Application Lifecycle Management with Open Source Tools (slides in pt-br), showing how projects of any size can benefit from the amazingly powerful open source tools that exist today, that can consistently reduce project risk while being unintrusive and helping improve developers satisfaction. I was lucky that Edson Yanaga also came early to the event, and had the pleasure to have him co-presenting the tutorial with me. Edson is a believer of the Software Craftsmanship movement, and his usage of the toolset to promote better development is a burst of energy to those listening. After my presentation, at the hallway right outside the tutorial rooms, we ended up in the middle of a very diverse group, composed by Java, .NET and Linux developers. That made for a lively conversation! It is always interesting to see how developers in a live setting can discuss and share experiences, that many times is impossible to do online on lists and forums (because it quickly degenerates) or even in traditional events where one technology is dominant. That one discussion proved the success of LinguÁgil’s approach! A full day of talks: the power of simplicity! Saturday is the day where the talks happen. One auditorium, one track, one day. The power of this simplicity is sometimes lost when we try to make really large events with lots of parallel activities. But with a single room, developers get to watch the whole set of speakers, and everyone enjoys it. One-track events happening on Saturday is a great way to do something easy to organize, but powerful. In the case of LinguÁgil, it also foster the merging of the communities. Developers don’t self-separate on their own tracks and communities, and everyone has a chance to learn from the success of everyone else. For the speakers, it is great to be able to give talks that span multiple communities, and be able to reach developers from all areas. Together with Edson Yanaga, I did the opening presentation of the event, “Jack, the Giant Slayer, a Cloud Computing Story” (in pt-br: “Escalando o Pé de Feijão”). Going higher and higher into cloud technologies, we spoke about the importance of automation on software development, and how you can benefit from virtualization and cloud technologies to achieve higher levels of automation in your projects, improving both the development side, but also fostering DevOps practices. Although we are Java developers, our focus was on language-agnostic open source tools and ideas, and from the questions and comments, that was appreciated by the crowd. Whenever you have time to meet with other developers and friends, better use the time wisely. Since we were meeting face to face, me and Edson submitted a joint talk to JavaOne. I don’t think I ever submitted so early before, and felt really good, glad we found some time to do it! If you have not submitted your talk to JavaOne 2014 yet, why not submit this week? All in all, it was a great and fun event! I’d like to thank Otávio Santana, director of SouJava and JavaBahia, for the invite to the event, and also, many thanks to Oracle and the Java Champions program for making my presence there a reality! To the LinguÁgil team that received me so well: congratulations guys, you did an amazing event, and I truly enjoyed being part of it! A couple of days ago a friend of mine told me that “the year is finally about to start”. He was repeating a popular saying that we have in Brazil, that the year only starts after Carnival. That is, today. It is true that the period between New Years and Carnival tends to be slow for projects and activities. But, when my friend said that, it got me thinking… So many things already happened in 2014! The year started with such high energy, that I’m really impressed that we’re just after Carnival! January started for me as a crazy time, because I had launched a series of videos to push developers to use better tools for software development. The initial idea of recording 3 videos ended up growing to 6 videos, 2 webinars, 2 interviews, many external participations and several side activities like events and discussions (sorry, those were all Portuguese!). In the end, more the 1500 people followed the “New Year, New Project” series, it was quite a start of 2014! Right in the middle of this, the JCP face to face meeting happened, together with the User Group Summit, in California. At the JCP meeting it was great to work together with Mohamed Taman and Badr Elhouari, representatives of Morroco JUG, the new elected JUG that joined the JCP Executive Committee and also with Jim Gough, London Java Community’s new JCP representative. Together we presented new ideas for more community activities around Adopt-a-JSR and other cool things that companies can do to engage better with JUGs worldwide. For JUGs, there are great ideas on the presentation that will surely help to improve existing or new Adopt-a-JSR efforts. And several Java User Groups! In the same venue, and basically at the same time of the JCP meeting, was happening Oracle’s User Group Summit, with a large presence of Java User Groups. So, it is not surprising that many of the conversations during the summit were around Adopt-a-JSR. Besides getting to know what is being done by other groups, we had a great discussion about using Gamefication (led by Jim Bethancourt) and how we are seeing a stronger interest from developers on interactive activities. It was the general feeling that JUGs should consider implementing Hackatons, Competitions, and similar activities for their Adopt-a-JSR efforts and also during events and monthly meetings, that this will help grabbing developers attention. Right before the JCP and JUGs meetings, I joined Stephen Chin in hosting an amazing barbecue at his house. I came straight from the airport, with a brand new Brazilian rotating rotisserie grill, and landed in Steve’s house just minutes before the crowd arrived. Steve and Sharat had amassed an incredible list of typical supplies, from Brazilian cuts to sausages, famous drinks (both alcoholic and non), deserts and more! With the help of Jim Weaver and many others (not to mention the infinite support and patience from Steve’s family! 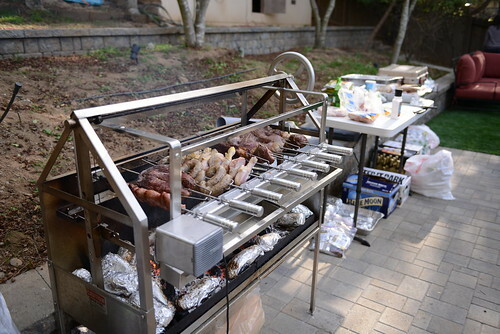 ), we sprung a full, authentic, Brazilian barbecue in the hearth of Silicon Valley. That’s Steve’s “Chinascaria”, and you should come if you ever have the chance! And talking about hackatons, this is exactly what we did right after the Summit! I’m the President of the Campus Party Institute, and help organize one of the world’s largest gathering of Internet geeks and nerds, the Campus Party Brazil event, in São Paulo. Campus Party is a 24h, non-stop event where thousands of Internet enthusiasts camp for a full week to discuss and experiment the Internet. During the event, SouJava organized and run a RaspberryPi hackaton, supported by Oracle. The competition highlighted the benefits of doing an around the clock event, and the teams worked for 3 days, with little sleep, to produce some incredible applications! It was great to work with Vinicius and Yara Senger, and all the SouJava team, on making this happen! The RaspberryPi challenge was just one of dozens of activities I was part of in Campus Party. Besides giving several talks, about Cloud Computing, Application Lifecycle Management, Open Source and Startups (talks in pt-br), I’m also responsible for the main stage of the event, and this year I got to receive some great speakers. It was nice to meet Bruce Dickinson, lead singer of Iron Maiden, and watch his must see presentation about entrepreneurship. Another speaker that I really enjoyed watching and talking with was Silvio Meira (talk in pt-br), one of the great promoters of technology and startups in Brazil. There are many things that need to be done in this country to support new ideas and innovative companies, and Silvio knows them all. Very inspiring! After 7 days living inside Campus Party, I was really ready for the year to end… How come it didn’t even start yet? But there was more things happening! Adopt-a-JSR activities are picking up, and CloJUG did a nice hangout with a few JUGs, to share experiences, organized by Alexis Lopez. Most of it was in Spanish (bad Portunhol in my case), but Jim Gough spoke in English. I also added some English notes in the link above. SouJava also started 2014 reinvigorating its Adopt-a-JSR efforts, and with more then 100 participants on the program, we are now running by-weekly meetings, that are going pretty well, thanks to SouJava’s JCP EC representative Fábio Velloso rounding up the participants! Proving that developers are interested in more hands-on activity, I helped in one more hackton, this time supported by IBM. On the Mobile Hackaton, developers worked to create mobile applications for large events, like the World Cup. The applications created in 3 days were pretty impressive, and the judges had a though job! The event was masterfully organized by Yara Senger, from Globalcode. Even a new application server? SouJava also hosted RedHat’s WildFly launch. 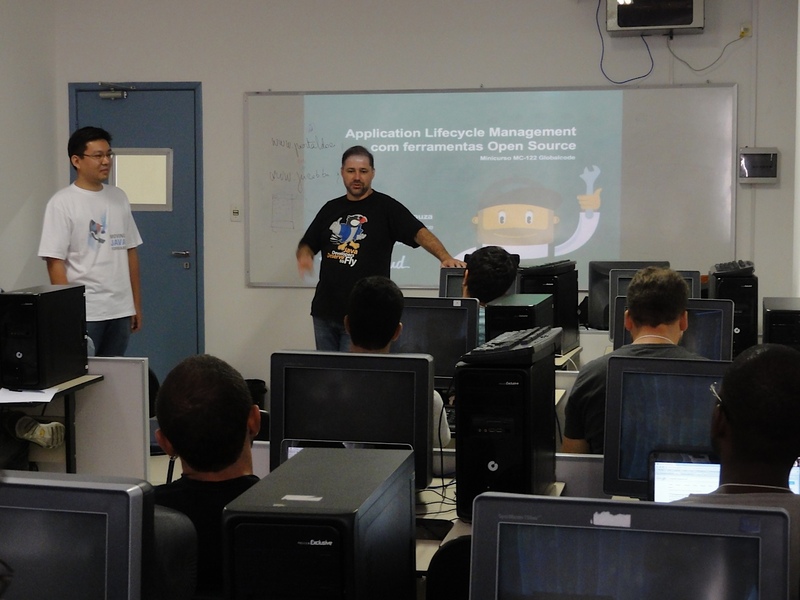 We had presentations from Fábio Velloso, SouJava Director, and Arun Gupta, RedHat’s Evangelist. 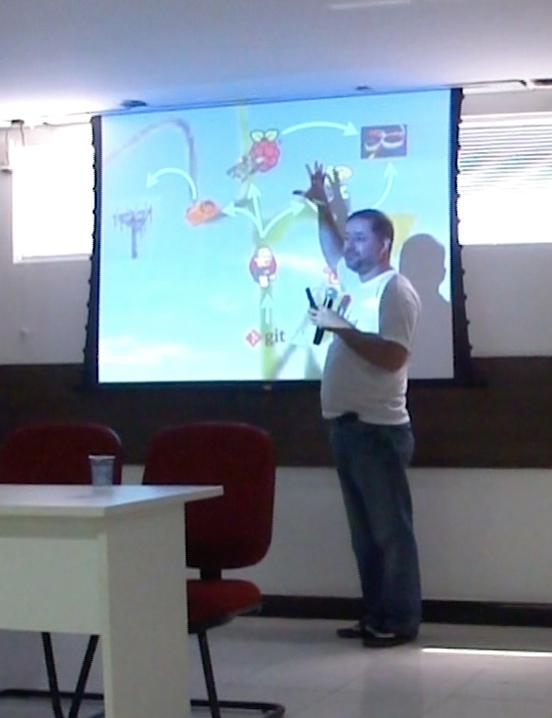 The event was transmitted live (partially in pt-br) from inside the Free Software Competency Center of the University of São Paulo. Startups! Don’t forget the startups! every hackaton ends up agitating this discussion also. 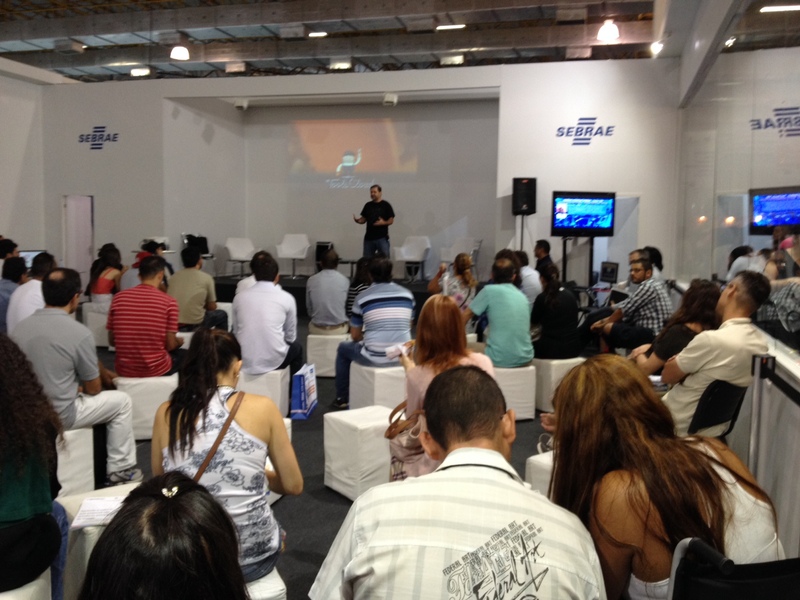 Recently I was invited to talk about my experiences at StartupWorld, an event hosted by Sebrae, the Brazilian Service of Support for Micro and Small Enterprises. The energy and interest of the startups was very exciting, and I talked about how Cloud and Internet technologies can be effectively used to support and foster innovation. And now, the year can really start! Looking at my friend, I wasn’t sure exactly where to start explaining to him how many things already happened in 2014… So, I told him that I’m looking forward for the year to start, because it looks like it will be really really busy! And I’ll jump start it by submitting a talk to JavaOne! That should be a good first move! So, how does your 2014 looks like? Maybe we can meet somewhere for a barbecue?